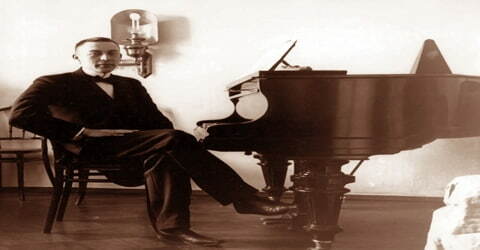 Sergei Rachmaninoff – Russian composer, virtuoso pianist. One of the most formidable pianists of all time and the last truly great composer in the Russian Romantic tradition, Sergei Rachmaninoff was born in Semyonovo, Russia, on April 1, 1873. He was a composer who was the last great figure of the tradition of Russian Romanticism and a leading piano virtuoso of his time. He is especially known for his piano concerti and the piece for piano and orchestra titled Rhapsody on a Theme of Paganini (1934). When Sergei was nine, financial difficulties forced the sale of the family estate and they moved to St Petersburg, where he took piano lessons at the Conservatoire. Rachmaninoff’s cousin, the pianist, and conductor Alexander Siloti, had studied in Moscow with the strict Nikolai Zverev and suggested that Rachmaninoff go to Zverev as well, and so in 1885, he made the journey to Moscow, staying with Zverev for three years. 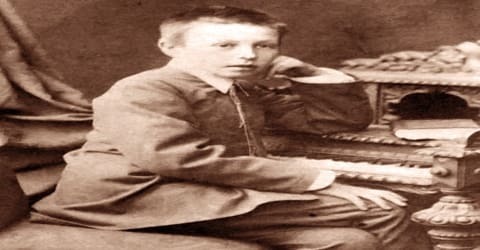 In 1888 Rachmaninoff began to study piano with Siloti himself and composition with Sergei Taneyev and Anton Arensky; he also received advice from Tchaikovsky, who was a friend of Siloti and his former teacher. Between 1918 and 1943, he completed just six works, including Rhapsody on a Theme of Paganini, Symphony No. 3, and Symphonic Dances. By 1942, his failing health led to his relocation to Beverly Hills, California. One month before his death from advanced melanoma, Rachmaninoff was granted American citizenship. Sergey Rachmaninoff, in full Sergey Vasilyevich Rachmaninoff, Rachmaninoff also spelled Rakhmaninov, or Rachmaninov, was born on 1st April (O.S. 20 March) 1873, in Semyonovo, Russia. He was born into a family of the Russian aristocracy in Russian Empire. His father was a retired army officer and his mother the daughter of a general. The boy was destined to become an army officer until his father lost the entire family fortune through risky financial ventures and then deserted the family. 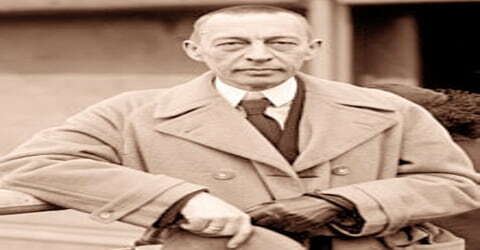 Rachmaninoff began piano and music lessons organized by his mother at age four. She noticed his ability to reproduce passages from memory without a wrong note. Upon hearing news of the boy’s gift, Arkady suggested she hire Anna Ornatskaya, a teacher and recent graduate of the Saint Petersburg Conservatory, to live with the family and begin formal teaching. Rachmaninoff dedicated his piano composition “Spring Waters” from 12 Romances, Op. 14 to Ornatskaya. At age 19 he graduated from the conservatory, winning a gold medal for his one-act opera Aleko (after Aleksandr Pushkin’s poem Tsygany -“The Gypsies”). Sergei Rachmaninoff married Natalia Satina on 12 May 1902 after a three-year engagement. Because they were first cousins, the marriage was forbidden under a Canon law imposed by the Russian Orthodox Church; in addition, Rachmaninoff was not a regular church attendee and avoided confession, two things a priest would have had to confirm that he did in signing a marriage certificate. The couple had two daughters, Irina Sergeievna Rachmaninova (1903–1969) and Tatiana Sergeievna Rachmaninova (1907–1961). 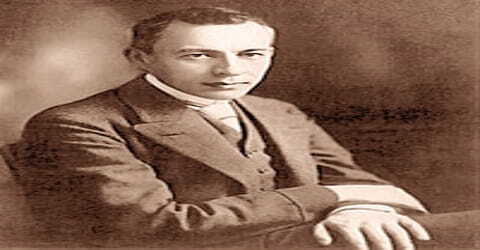 Rachmaninoff’s fame and popularity, both as composer and concert pianist, were launched by two compositions: the Prelude in C-sharp Minor, played for the first time in public on September 26, 1892, and his Piano Concerto No. 2 in C Minor, which had its first performance in Moscow on October 27, 1901. The former piece, although it first brought Rachmaninoff to public attention, was to haunt him throughout his life the prelude was constantly requested by his concert audiences. The concerto, his first major success, revived his hopes after a trying period of inactivity. The premiere of his First Symphony, in Moscow in 1897, was a disaster (word was that the conductor, Alexander Glazunov, was drunk), and Rachmaninoff destroyed the score (fortunately, a set of parts survived, which allowed the reconstruction of the score after Rachmaninoff’s death). His early career established a pattern he was to follow throughout his life: an uneasy struggle between performing and composing, with economic pressures usually ensuring that precedence needed to be given to the demands of the platform. He was an international figure as early as 1899, when he conducted a concert of his orchestral works in London, also playing some of his piano music. Rachmaninoff spent his summer break in 1890 with the Satins at Ivanovka, their private country estate near Tambov, to which the composer would return many times until 1917. The peaceful and bucolic surroundings became a source of inspiration for the composer who completed many compositions while at the estate, including his Op. 1, the Piano Concerto No. 1, which he dedicated to Siloti, in July 1891. Also that year, Rachmaninoff completed the one-movement Youth Symphony and the symphonic poem Prince Rostislav. Early setbacks in his compositional career — particularly, the dismal reception of his Symphony No. 1 (1895) – led to an extended period of depression and self-doubt, which he overcame with the aid of hypnosis. With the resounding success of his Piano Concerto No. 2 (1900-1901), however, his lasting fame as a composer was assured. The first decade of the twentieth century proved a productive and happy one for Rachmaninov, who during that time produced such masterpieces as the Symphony No. 2 (1907), the tone poem Isle of the Dead (1907), and the Piano Concerto No. 3 (1909). On 29 May 1892, the Conservatory issued Rachmaninoff with a diploma which allowed him to officially style himself as a “Free Artist”. Upon graduating, Rachmaninoff continued to compose and signed a 500-rouble publishing contract with Gutheil, under which Aleko, Two Pieces (Op. 2) and Six Songs (Op. 4) were among the first published. The composer had previously earned 15 roubles a month in giving piano lessons. In 1904 Rachmaninoff took up a conductor’s post at the Bolshoi Opera in Moscow, stimulating the completion of two further operas, Francesca da Rimini and The Miserly Knight, in 1906. The pressures of conducting life in the Bolshoi persuaded the Rachmaninoff’s to spend some time away from the capital, and they moved for a short while to Dresden, where he worked on his Second Symphony; Rachmaninoff himself conducted the premiere, in St Petersburg, in 1908. In 1893, he spent a productive summer with friends at an estate in Kharkiv Oblast where he composed several pieces, including Fantaisie-Tableaux (aka Suite No. 1, Op. 5) and Morceaux de salon (Op. 10). In September, Rachmaninoff published Six Songs (Op. 8), a group of songs set to translations by Aleksey Pleshcheyev of Ukrainian and German poems. In Philadelphia and Chicago, he appeared with equal success in the role of conductor, interpreting his own symphonic compositions. Of these, the Symphony No. 2 is the most significant: it is a work of deep emotion and haunting thematic material. While touring, he was invited to become permanent conductor of the Boston Symphony, but he declined the offer and returned to Russia in February 1910. 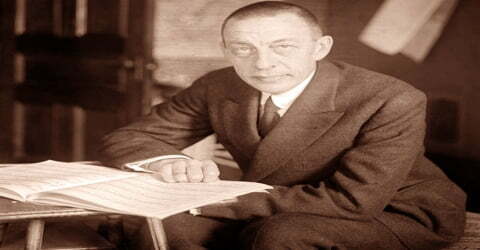 While in Dresden, Rachmaninoff agreed to perform and conduct in the United States as part of the 1909–10 concert season with conductor Max Fiedler and the Boston Symphony Orchestra. He spent time during breaks at Ivanovka finishing a new piece specially for the visit, his Piano Concerto No. 3 (Op. 30), which he dedicated to Josef Hofmann. The tour saw the composer make 26 performances, 19 as pianist and 7 as a conductor, which marked his first recitals without another performer in the program. Upon his return home in February 1910, Rachmaninoff became vice president of the Imperial Russian Musical Society, whose president was a member of the royal family. Later in 1910, Rachmaninoff completed his choral work Liturgy of St. John Chrysostom (Op. 31), but it was banned from performance as it did not follow the format of a typical liturgical church service. For two seasons between 1911 and 1913, he was appointed permanent conductor of the Philharmonic Society of Moscow; he helped raise its profile and increase audience numbers and receipts. In 1912, Rachmaninoff left the IRMS when he learned that a musician in an administrative post was dismissed for being Jewish. In 1915, Rachmaninoff completed his second major choral work, All-Night Vigil (Op. 37), after he attended a performance of the Liturgy of St. John Chrysostom and felt disappointed with it. After spending two weeks writing the All-Night Vigil, he passed the score to Sergei Taneyev for proofreading and correcting errors in its polyphony, but it was returned unaltered. It was received so warmly at its Moscow premiere in aid of war relief that four subsequent performances were quickly scheduled. During a vacation in Finland that summer, Rachmaninoff learned of Taneyev’s death, a loss which affected him greatly. By year’s end, he had finished his 14 Romances (Op. 34), whose final section, Vocalise, became one of his most popular songs. 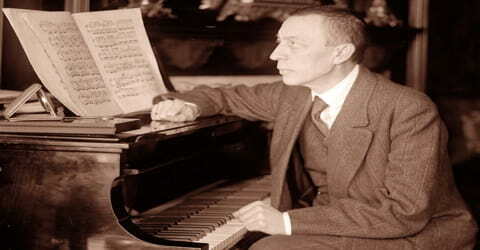 After the October Revolution in 1917, Rachmaninoff determined that he and his family would have to leave the country, and he accepted an invitation to perform in Stockholm. The composer, his wife, and their two daughters left in December; he was never to return. They stayed briefly in Stockholm and Copenhagen, sailing to America in November 1918. There, his concertizing increased, reducing his time for composition; he also began a career in the studio, producing recordings that eighty-odd years later are still regarded as some of the most valuable interpretations, of his own and others’ music, ever committed to disc. Rachmaninoff was possessed of a keyboard technique marked by precision, clarity, and a singular legato sense. Indeed, the pianist’s hands became the stuff of legend. He had an enormous span – he could, with his left hand, play the chord C-E flat-G-C-G – and his playing had a characteristic power, which pianists have described as “cosmic” and “overwhelming.” He is, for example, credited with the uncanny ability to discern, and articulate profound, mysterious movements in a musical composition which usually remain undetected by the superficial perception of rhythmic structures. In 1920, Rachmaninoff signed a recording contract with the Victor Talking Machine Company which earned him some much-needed income and began his longtime association with RCA. Early 1921 saw Rachmaninoff apply for documentation to visit Russia, the only time he would do so after leaving the country, but progress ceased following his decision to undergo surgery for pain in his right temple. The operation failed to relieve his symptoms; he only found relief after having dental work later in the decade. After leaving the hospital, he purchased an apartment on 33 Riverside Drive on the Upper West Side of Manhattan, overlooking the Hudson River. There too he maintained a Russian atmosphere by observing Russian customs, serving Russian food, and employing Russian servants. Rachmaninoff’s only substantial works from this period are the Symphony No. 3 in A Minor (1936), another expression of sombre, Slavic melancholy, and the Rhapsody on a Theme of Paganini for piano and orchestra, a set of variations on a violin caprice by Niccolò Paganini. His last major work, the Symphonic Dances for orchestra, was composed in 1940, about two years before his death. He sought to recreate the peace he had found at Ivanovka by building a villa on the shores of Lake Lucerne, far from the insistent pressures of the international concert circuit, and here he wrote the Rhapsody on a Theme of Paganini and the Third Symphony which, in 1939, he recorded with the Philadelphia Orchestra, which maintained a long association with his music. 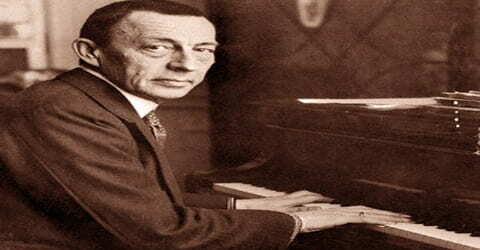 Fortunately for posterity, Sergei Rachmaninoff recorded much of his own music, including the four piano concerti and what is perhaps his most beloved work, the Rhapsody on a Theme of Paganini (1934). 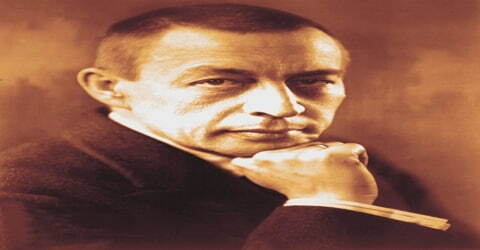 Rachmaninoff wrote five works for piano and orchestra: four concertos No. 1 in F-sharp minor, Op. 1 (1891, revised 1917), No. 2 in C minor, Op. 18 (1900–01), No. 3 in D minor, Op. 30 (1909), and No. 4 in G minor, Op. 40 (1926, revised 1928 and 1941) plus the Rhapsody on a Theme of Paganini. Of the concertos, the Second and Third are the most popular. Rachmaninoff’s last large-scale masterpiece was the Symphonic Dances, composed in 1940; at the time of his last recital, on 17 February 1943, in Knoxville, Tennessee, he was already gravely ill, and he died on 28 March, in Beverley Hills. A message from several Moscow composers with greetings had arrived too late for Rachmaninoff to read it. His funeral took place at the Holy Virgin Mary Russian Orthodox Church on Micheltorena Street in Silver Lake. In his will, Rachmaninoff wished to be buried at Novodevichy Cemetery in Moscow, the same as Scriabin, Taneyev, and Chekhov, but his American citizenship could not see the request through. Instead, he was interred at Kensico Cemetery in Valhalla, New York on 1 June. A statue marked “Rachmaninoff: The Last Concert”, designed and sculpted by Victor Bokarev, stands at the World’s Fair Park in Knoxville as a tribute. 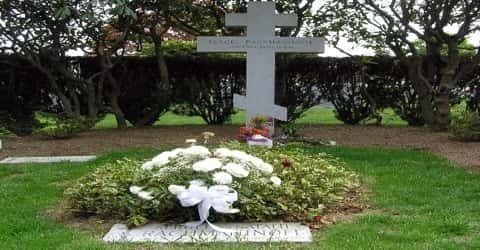 In August 2015, Russia announced its intentions to seek reburial of Rachmaninoff’s remains in Russia, claiming that Americans have neglected the composer’s grave while attempting to “shamelessly privatize” his name. The composer’s descendants have resisted this idea, pointing out that he died in the U.S. after spending decades outside of Russia in self-imposed political exile. Rachmaninoff’s personal reserve was complemented by a deeply generous nature, which is reflected in the disciplined opulence of his music. Although his critical status fell somewhat during the post-War dominance of modernism, the affection in which his music was held by audiences never wavered, and now the critics are realizing that the public was right all along: Rachmaninoff’s music often attains greatness there is individuality in its harmonic richness, orchestral coloration and melodic warmth which will guarantee it a permanent and much-loved place in the repertoire. Rachmaninoff’s music, although written mostly in the 20th century, remains firmly entrenched in the 19th-century musical idiom. He was, in effect, the final expression of the tradition embodied by Tchaikovsky a melodist of Romantic dimensions still writing in an era of explosive change and experimentation.